They say that your wedding is the start of a brand new life for you and your husband-to-be. The celebrations, the special occasions, the social events– those are all just the beginning. For even as you put together everything you need for your dream wedding, you will be learning a lot more about each other, from the most trivial quirks to the most important details. How you each prioritize, or manage finances, or solve problems are some of the very useful things to know during your wedding planning stage, sure. But even more, mundane stuff from preferences in food, music, or decor, and even how you entertain guests or interact with each others’ family and friends also come into play. Your wedding gets you more involved than most celebrations making it a great foundation to get to know each other even more. DIT: Everything is Better When You’re Doing It Together. When planning your wedding you have to work together to decide what really matters to you as a couple. Years from now, when you look back, you will always remember those days when you both went to the gym and made the effort to lose weight, your trips out of town to look for that elusive one-of-a-kind wedding venue, attending the all-too-important food tasting appointments, and even going to fitting sessions with members of your entourage, just to name a few. DIY wedding projects are a lot more meaningful when you DIT, or Do It Together. Think of the DIT Movement as our way of encouraging couples to be as invested as possible, as early as the wedding planning process. We believe that, as a couple about to get married, each of you should be just as involved in the entire process: from deciding on a date and venue, to figuring out a theme or motif for your big day, up to choosing your wedding vendors, managing your guest list, all the way down to deciding what favors or souvenirs to give away, or writing down toasts to recognize people for their contributions to what might be the most important day of your life– the entire experience only serves to strengthen your relationship as a couple. Both of you not just feel included, valued, and heard when you DIT, you also create a lot of new memories together throughout the entire process. As your own wedding planning journey is made more meaningful, we also hope that you also have fun and learn a lot of things about each other along the way. Life is Short, Celebrate Everything! 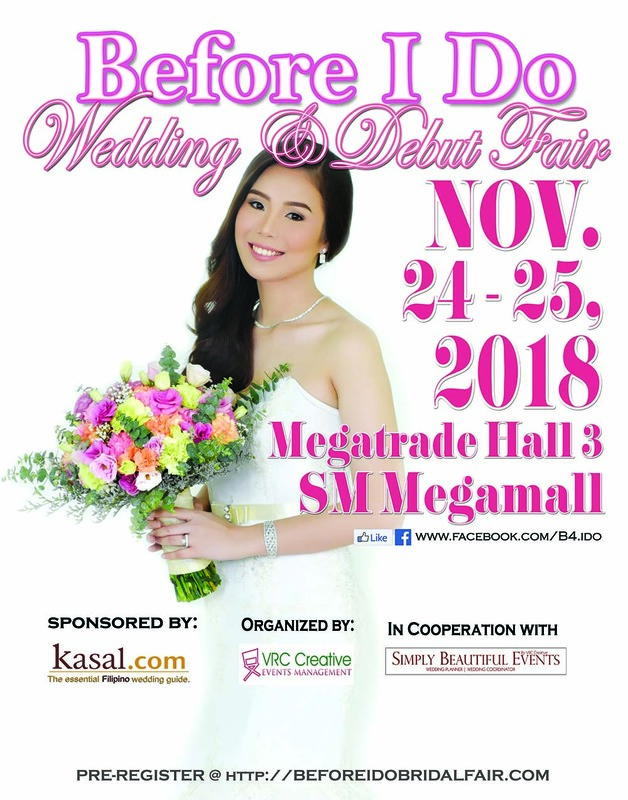 If you need more help putting things together for your big day, come bring your fiance (or your girlfriends, or your family and friends) to the Before I Do Wedding and Debut Fair, happening on the weekend of November 24 and 25, 2018, at Megatrade Hall 3, SM Megamall. The longest-running intimate bridal event of its kind, the Before I Do Wedding and Debut Fair helps make planning your special day easier and a lot more convenient, as our featured vendors and venues are all happy to help you out with special packages and other promos just for the weekend. BT Collection, The Wild Ones Videography, The Grand Cobo Events Place, Godfather Shoes, Vireef Digital Inc., Ivan Ruiz Atelier, Happy Town Coffee, Maru Rodriguez Artistry, Densol’s Catering and Events, Global Noble International Corp., Erick Delim Photography and Films, Felipe and Sons, Great Image Events Photography, Silvermoon Studios, Alon Wedding Photo and Films, Liz Rañola Photography, Antipolo Valley Event Center, La Rosa Bridal, Cactus and Canvas, Photoman, J’s Diamond Jewelry, Infinity Closet, AMI Jewels, Bounce Events Ground, Studio1 Photography, Hair and Makeup by Gloria Cruz, Print & Co., TEAMRED: Makeup by Red Gaa, A. Bernardo’s Jewelry, A&V Studios, Polespino Photography, Diamond with Love Jewelry Shop, Nice Print Photography, Makeup by ReyC, Print Divas, Eventist Manila and Makeup by Miss A. For your convenience, go right ahead and register at http://beforeidobridalfair.com, and present your ticket at the entrance to enter for FREE! Doors open at 11:00 am daily. Three (3) lucky early bird brides and debutantes get a gift from Simply Beautiful Events. Other prizes to be given away to event attendees for the weekend include special gifts from sponsors and exhibitors during the hourly raffle draws. This event is made possible with the help of Jeffrey Namoc Events Styling, Sound Level, Kasal.com, The Top Knotters, EventsVenuePH, TagaytayLiving.com, Weddings Tagaytay, WhenInManila.com, Business Mirror, The Mango Farm, Mitch Desunia Bridal, Sugar Petals Enterprise & Events Management, Makeup by Anne Magadia, Imelda’s Jewelry, Dangwa Florist, Megatrade Hall, SM Megamall and Simply Beautiful Events. Remember, in wedding planning everything is better when you DIT. Before I Do Bridal Fair Series is produced and organized by VRC Creative Events at Megatrade Hall, SM Megamall where we have over 3,000 anticipated guests per event with not more than 100 of Manila’s established and upcoming event suppliers under one roof. For inquiries on how to be an exhibitor, get in touch with our team at 8093119 or 09178587787.